SAN FRANCISCO—The J.P. Morgan Healthcare Conference offers companies an annual shot at having many of their investors and potential investors in one place at the same time. 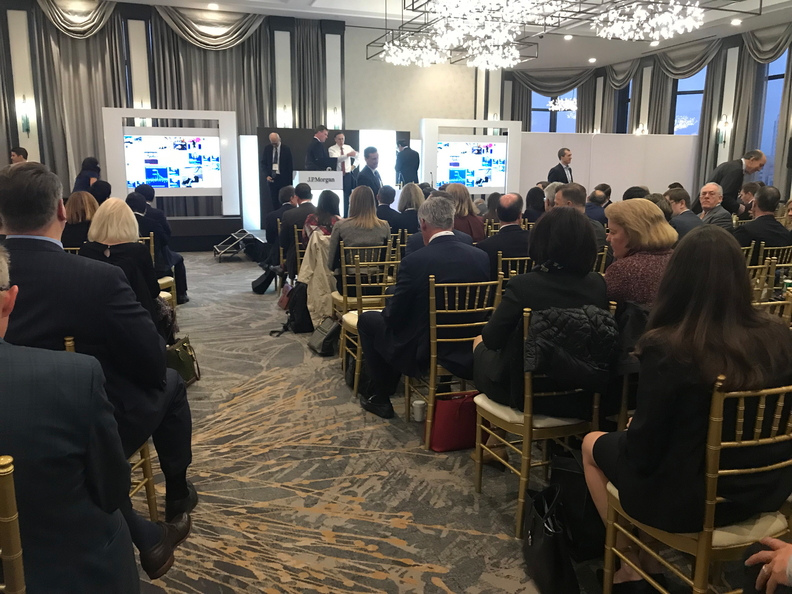 While the podiums are far more populated by pharmaceutical and biotech companies, major health systems and insurers find it an invaluable setting for dealmaking, schmoozing and articulating their strategies for the upcoming year. The 37th annual conference didn't deliver the same number of blockbuster deals as it has in previous years, but M&A was still a huge topic of conversation. Presentations were more focused on making the case for mega-deals, especially for those that still have skeptics. One example was CommonSpirit Health, the pending mega-merger between not-for-profit health systems Dignity Health and Catholic Health Initiatives. During his presentation, Dignity CEO Lloyd Dean said people ask him all the time why he's doing it. He opened by explaining why he's not. "Size is not our driver at all, but we are proud of the fact that we will be a significant player in the healthcare community of this nation," he said. "With our combined footprint, we have the capability of touching 1 of out every 4 Americans in this country." The companies expect to close the deal by Jan. 31, a one-month delay from the previous closing timetable. Baylor Scott & White leaders explained their pending merger with Memorial Hermann will land the system in Houston, one of the fastest-growing areas of Texas. CEO Jim Hinton told Modern Healthcare the added scale will create efficiencies that drive down costs. That's what happened when his health system was created through a 2013 merger, he said. Since then, Baylor Scott & White has saved about $740 million, 128% of its original goal. "This notion that these mergers always result in higher costs—that may be true for other mergers, but that's not been our experience, nor is that our intent," Hinton said. Meanwhile, CVS Health CEO Larry Merlo reiterated before a packed audience his vision of creating America's front door to healthcare through the company's merger with Aetna. Companies not negotiating or digesting major deals readily described their ideal partners. Centene CEO Michael Neidorff told Modern Healthcare he wants to find something on par with the company's acquisition of Fidelis Care, which allowed it to enter New York. "We don't look for bad companies we can make good," he said. "We look for good companies that can avail themselves of our technology and capability." Executives with other health systems, group purchasing organizations and insurers expressed similar appetites for forging new partnerships. Providers were also eager to exhibit the fruits of their cost-cutting labor, with a specific focus on how their integrated health plans provide cheaper care and pass the savings along to members. Intermountain Healthcare, for example, lowered its exchange plan premiums 2.7% on average from 2018 to 2019, CEO Dr. Marc Harrison told Modern Healthcare. He estimates Intermountain's interventions have saved Utah consumers $10 million to $15 million. Robert DeMichiei, chief financial officer of the UPMC health system, told investors his team tracks cost at every level—cost per operating room hour, cost per claim and so on—and works to lower each one. "We need to be zealots on cost," he said. Karen Murphy, Geisinger's chief innovation officer, said Geisinger's Steele Institute for Healthcare Innovation is in the midst of an affordability project in which it's studying how much it has to lower the cost of care for patients in order to generate a return for its health plan members. "We're going to put a stake in the ground on goals," she said. Dean made a bold move on behalf of the future CommonSpirit Health: He put out a recruitment call. "We want to be the place that many of the other providers and employees in here want to migrate to," he told the audience, and then joked: "We will be setting up applications outside of the room. For those of you that are trying to reduce costs, we are trying to gain quality expertise." As the industry pivots toward value-based care, systems are competing for a limited pool of talented hospital and physician leaders that truly understand risk. Many of today's leaders have spent decades in a fee-for-service environment. "As we see the cycle going, the competition for management that knows what they're doing in value and risk in hospital settings, post-acute settings and physician settings is very tough," said Eric Klein, a partner with the firm Sheppard Mullin. With Optum buying DaVita's medical group, for example, lots of organizations will be "licking their lips" at the prospect of scooping up some of the executives that will be left behind, Klein said. For some, the conference provides the right dose of networking to find new talent. Highmark Health announced in July its chief financial officer, Karen Hanlon, would transition to becoming its chief operating officer once it finds a new CFO. Hanlon said she was on the prowl for her replacement. "I laugh and say, 'It hasn't been a recruiting event,' but yet it has been a little bit for me," she said. The promise of artificial intelligence and machine learning was talked about a lot at last year's conference, but this year, health systems were more explicit about how they're using those technologies. "It wasn't a, 'It will be coming,' " said Sheppard Mullin's Klein. "It was, 'Here's how we're starting to use it.' "
For its part, Geisinger is studying how it can use A.I. and machine learning to lower its operating costs, Murphy said. The trick will be figuring out which repetitive actions can be targeted. "I think really one of the greatest, quickest returns for A.I. in healthcare is going to be on administrative processes," she said. When it comes to health systems, the use of A.I. and machine learning has so far been "very patchy," said Amanda Berra, senior research partner with the consultancy Advisory Board. At the top of the heap, some systems not only have venture arms, but a systematic way to bring those innovations into their practice, she said. "I've spent a lot of time at this conference thinking about the maturity curve in innovation" she said. Using technology to promote patient engagement was nearly ubiquitous across health systems' presentations this year. At this point, if a health systems' patients can't make appointments using their phones, it's falling behind. "This year there was not a single presentation I went to that didn't say 'patient engagement' at least one time," Klein said.